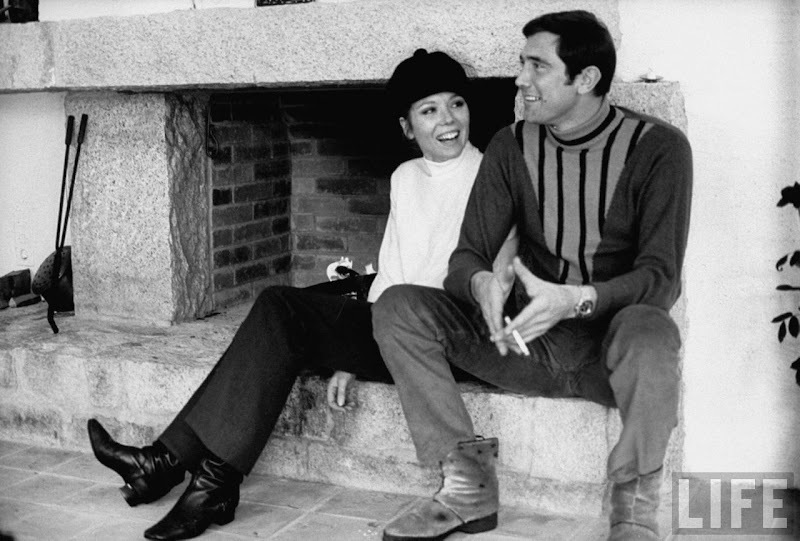 Photo of Actress Diana Rigg with co-star George Lazenby from the film On Her Majesty's Secret Service by Terence Spencer, 1969. Was not a fan of her as Mrs.James Bond, but looved her in The Avengers. I heart Diana Rigg! Never seen this photo before. I'd also like to say: I really wish men still dressed like that. Thank you for choosing Diana Rigg! She epitomizes the intelligent woman who can hold her own against any man, and look ravishing doing it. Diana Rigg is a perfect choice for Tomboy Style! My favorite Bond (why only one, George? Why?! The end of the movie just slays me...). Diana Rigg is lovely, of course... My dad, who is rarely overly effusive, gets all dreamy eyed at the mention of her. It's really funny! I lived for the Avengers and as an 8 year old kid wore GoGo boots with a plastic stiletto knife I stuck inside.